At UTH Hospital a team of neurosurgeons and ENT surgeons have successfully removed a tumour from the middle of a man’s brain through his nasal passage in a very advance process called a Trans nasal Trans-sphenoidal approach. The operations lasted over seven hours and marks the first time this operation has been conducted by a group of indigenous Zambian surgeons. The patient is now awake and stable. One of the surgeons, Dr Kachinga Sichiya says he is on behalf of his team excited at the historic development that will go down in the country’s largest hospital’s history. “ I am excited at this new development. Many patients are on the waiting list for this operation while a luck few have gone to India for surgery. That is going to be history now. “We are thankful to our friend Patrick Cameron for buying this equipment which is going to impact many lives, “ says Dr. Sichizya on his Facebook page, today. Having suffered from a ‘brain drain’ for many years, which has seen good quality Zambian doctors leave the country for better opportunities this marks a turning point for our healthcare system. 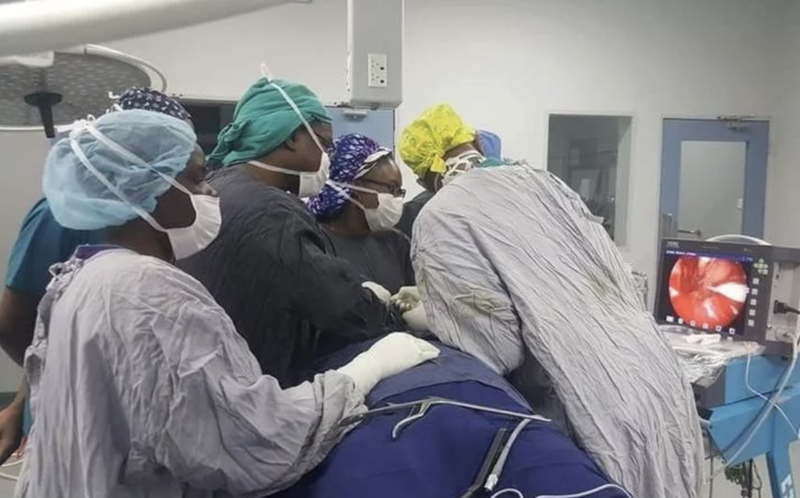 Although there are still many challenges, namely lack of proper funding, it is hoped that this story will inspire more Zambians to become surgeons.